In January, Hulu announced that its premium Hulu Plus service was eventually headed to Android devices, although it was never disclosed when, or to what devices. 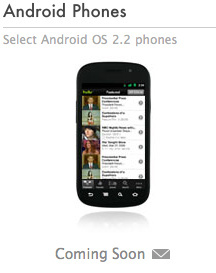 This weekend, the company has updated their devices page with a picture of the Nexus S and a note that says "Select Android OS 2.2 phones" and "Coming Soon." The Nexus runs on Gingerbread 2.3, so it seems like Hulu Plus will be available on 2.2 and higher devices. There was no word on Android tablets. It is unclear what "coming soon" implies, but it is at least good to see the company has not forgotten about its promise for Android phone support. Well I have the PlayOn Media app installed on my phone which offers a whole slew of content providers(as well as my own saved content)to me so it pretty much negates my need for this or any other specific app for that matter.